We have a small bird bath on our back patio. It’s the solid concrete type with no pump to keep the water flowing…it just holds collected water. From our kitchen window, we enjoy watching the birds splash, flap their wings all around, pick at their feathers and get clean. I’ve seen them drink from it on hot summer days. We’ve seen redbirds, bluebirds and small baby birds enjoy the small bird bath. It’s really a cool thing to have. However I recently noticed something kind of nasty. Since the water doesn’t get circulated or refreshed, it tends to get stagnant and turns brown. The water also tends to evaporate in the summer and freeze in the winter. It’s effectiveness and value as a source of life and refreshment for the birds is limited…because of one thing…it lacks a pump. 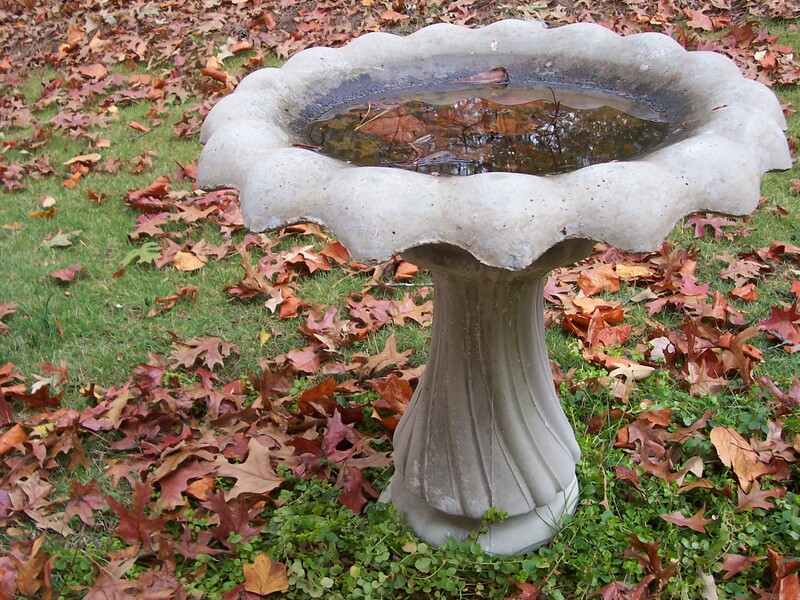 I believe that sometimes our hearts can get like my bird bath. People can enjoy our company, they can “bath” in our presence and they can take advantage of (drink) of what we have to offer the world. I believe we can be a source of life and help to others given the right conditions. I know in my life, my ability to positively impact and serve others can be limited because sometimes things get stale, I run out of steam…I have no “fresh source of water”. As a result, I become tired, frustrated and end-up being less effective and valuable to those around me (and to myself). Like the bird bath, I believe we need a recycling effect in our hearts. I believe we need someone to ‘stir the water’. I believe we need fresh water (love? ), fresh movement and fresh oxygen to our supply…to the supply of our hearts. I think the needed supply is a fresh, quiet time with God. If we fail to get this needed “oxygen” our lives tend to have a dull edge, have less meaning, seem empty, full of an uneasiness and a discontentedness. I believe we need to ask God for a stirring, a fresh presence, a fresh love and grace. Then and only then, I believe, can we truly honor Him and live out what He has given us to do in this world. Is your life source sustainable? I love reading these and smile not only regarding the content/insight, but also smile at picturing you living out your glory. Thanks for contributing to my life in SO many tangible ways!!! Great insight. Keep them coming.